Manager Malky Mackay says Cardiff City should be proud of their role in nurturing Arsenal midfielder Aaron Ramsey. Ramsey returns to Cardiff on Saturday, having been in impressive form for the Gunners this season. The Wales international left the Bluebirds for Arsenal in 2008 but returned for a brief loan spell during the 2010-11 season. "I hope he gets a great reception and I am pretty sure he will," Mackay said. "You try to nurture and then sell on to the bigger clubs to survive. That's what Cardiff City did at the time. "That's great credit to the people that were here and the academy side of it to bring him through. "They're the things the club should be proud of." 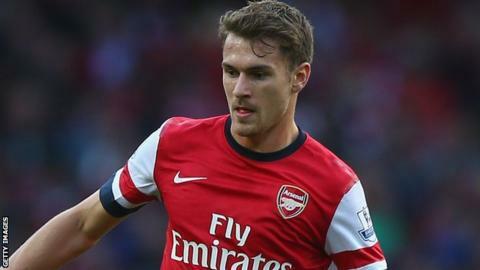 Ramsey, 22, has been in fine form for Arsenal this season, scoring 11 goals for Arsene Wenger's side in all competitions. He moved to Emirates Stadium six years ago but broke his leg against Stoke City in February 2010. The former Wales captain admits he lost a lot of confidence after the injury and his comeback included a spell on loan at Cardiff in 2011. "He is a fine young man, I met him a couple of weeks ago when the Welsh squad were here," Mackay added. "He popped in and I said to him to make sure that he went easy with us in a couple of weeks' time. "He's had to bide his time. Sometimes maturity and experience comes at different parts of your career. "But the biggest factor for him is the number of games he is getting on a consistent basis. "He is beginning to show for club and country what a top young talent he is. "We will deal with him as we deal with most teams and players: we have got to concentrate on the strengths and weaknesses of the opposition."